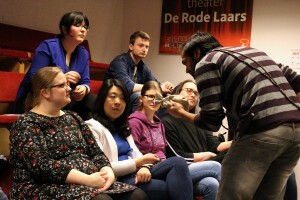 “Theater is a community” was one of the messages for this years World Theater Day. Inspired by this, three theater groups from Nijmegen came together on the 28th of March to celebrate together via a joined rehearsal. One of these groups was WOW-EFFECT Theater. We met each other at de Rode Laars on the campus of the Radboud University in Nijmegen. 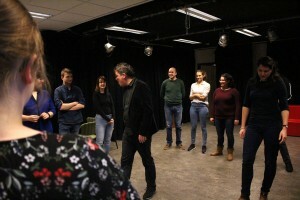 Around twenty members from the amateur theater groups The Fool’s Men, Toneelgroep Twister and WOW-EFFECT Theater met on this Wednesday evening to show each other their work, give each other feedback and generally get to know each other through our shared medium of art. 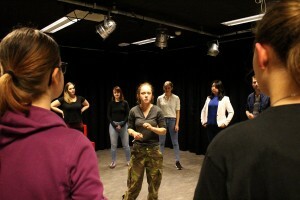 This joined rehearsal was organised by WOW-EFFECT Theater’s founder Tulya Kavaklioglu. She led us through the evening and was responsible for getting so many like-minded people together in one room. The first group to show off their work was WOW-EFFECT. Under the direction of Tanya de Kruijff the group showed off one scene from their current play THE LOST BOY. Because a few actors from the group couldn’t make it to this event, some actors from other groups filled in the gaps, something that led to a very interesting experience for everyone involved. After WEs scene, The Fool’s Men took up the stage. The Fool’s Men, under the direction of Coco Clements, is a relatively new theater group that is currently working on their first performance. This very first project is, appropriately, one of Shakespeare’s own first plays, TITUS ANDRONICUS. This bloodiest of Revenge plays is often skipped past in academics as well as in the theatre, which the Fool’s Menbelieve is an absolute shame. 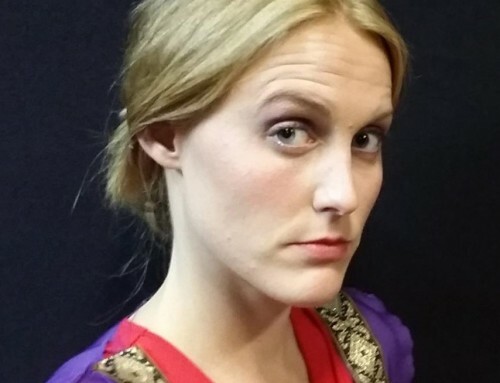 With the extra-ordinary addition of a FIVE-COURSE MEAL to this 5-act-play, they intend to engulf their spectators within the dangerous city-bounds of Shakespeare’s ancient Rome, the amazing Elizabethan theatre practices itself and of course, a delicious Renaissance dinner in style. 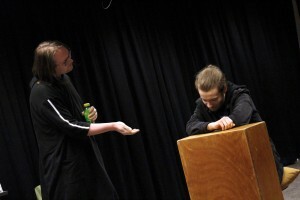 One actor from WOW-EFFECT Theater is also part of this troupe and switched from his role in THE LOST BOY quickly to his very different character in TITUS ANDRONICUS. Last, but surely not least, was Toneelgroep Twister. Twister showed off a scene from their upcoming play KATHARSIS, directed by Tanya de Kruijff (yes, who also directs WE!). 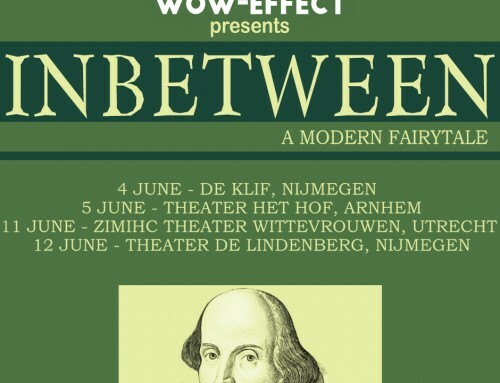 The play was performaned in English, but even those in the audience without knowledge of English were able to feel and see the emotions in the scene. KATHARSIS is a story about lova, sexuality, identity and (crossing) boundaries. “Katharsis” is a student ice skating association. Over the summer break one of the members is sexually assaulted by another member and now has to deal with seeing him again and the effects of her assault. Other members of the association deal with questions revolving their sexuality and the future of their relationships. After rehearsal almost all participants moved over the Sportcafé. Here they got to know each other even better, discussed different acting technique and tricks and let the evening flow out like a warm summer night. WE enjoyed this event a lot and we hope to be able to repeat it as an annual celebration from now on! Every director led the participants through a series of exercises. Some actors, like Piyush Sharma, are part of different theater groups and projects. Within the small community of theater makers, real emotions can be performed very easily. Barbara and Piyush perform TITUS ANDONICUS. Theater group Twister shows off an excerpt from their play.